Our rich and diverse cultural landscape has arisen not only from our ability to innovate but also because we can copy others and build upon the knowledge of previous generations. Although admittedly not to the same degree as us, chimpanzees and orang-utans in the wild also exhibit behavioural ‘cultures’. They too show an ability to plan, learn from others, and retain information over time. But are they able to combine these in the same ways as us by replicating behaviours after minutes, hours and months have passed? Are apes capable of deferred imitation? As humans, we imitate on a daily basis and rely on this ability to learn new skills from others: so much so that Meltzoff (1988c) dubbed us Homo imitans. Imitation – for the purposes of this article, copying the bodily actions of another – is just one of many specific, and oft-disputed, mechanisms through which individuals can learn novel behaviours. As a form of social learning, imitation is the linchpin to the development of traditions, and ultimately our culture. It allows for the transfer of information (behaviours, customs, etc.) between individuals and down generations without the need for genetic inheritance. Furthermore, social learning allows an individual to gain new knowledge and skills from their peers, family members, and even strangers, instead of relying on potentially dangerous individual learning. These advantages were recognised more than 30 years ago when Albert Bandura (1977) noted that social learning allows ‘people to acquire large, integrated patterns of behaviour without having to form them gradually by tedious trial and error’ (p.12). I am particularly interested in deferred imitation: copying a specific behaviour and then repeating it after a delay, sometimes years later. As humans, we are apt to copy others in this way, often without questioning why we do so. Take the story of ‘Sylvia’s recipe’, as told by Gergely and Csibra (2006). Sylvia, an Italian lady, had often observed her mother trimming the ends off ham before roasting it for dinner. Years later, when her mother came to stay, she was surprised to see Sylvia also trimming the ends off the meat before cooking it. When asked why, Sylvia explained how she had seen her mother do this – she had imitated this technique from her mother. However, the mother laughed and explained that Sylvia’s father had always bought a joint that was too large to fit in her baking dish and so she was always forced to trim it down to size! My interest goes beyond this ability of humans to imitate one another to the social learning evidenced by animals, in particular non-human primates. In recent years there has been an explosion in the number of articles written, and conferences held, debating whether the non-human animals that are capable of social learning also show signs of having their own ‘cultures’. Indeed, Rachel Kendal’s 2008 article in The Psychologist on animal ‘culture wars’ showed how this fascinating question has captured the imaginations of both the academic community and the general public. Do animals exhibit behavioural traditions that can, in any way, be compared to our own rich and diverse culture? To begin to answer this question, one must first consider whether animals are capable of imitating. In 2002 Courage and Howe defined deferred imitation as ‘the ability to reproduce a previously witnessed action or sequence of actions in the absence of current perceptual support for the action’ (p.257). Instead of copying what is currently occurring, the individual repeats the act some time after she first saw it. Deferred imitation is of particular import because it may reveal a more complex underlying cognitive process. The individual has to be able to both retain the information and recall it later, allowing her to reproduce the behaviour herself. Indeed, it has been proposed that the study of deferred imitation could not only shed light on mental representations and long-term memory, but also on how such information is perceived and encoded. Deferred imitation is vital to the transmission of behaviours and development of traditions because it allows for actions to be reproduced by individuals at a different time and location from when and where they were first witnessed. This ‘horizontal’ transmission has been studied experimentally through the use of ‘diffusion chains’. The diffusion chain method follows the rules of the children’s game Chinese Whispers or The Telephone Game, but instead of words or phrases being passed from one individual to the next, it is actions or behaviours that are transmitted. The fidelity of replication from each individual to the next along a chain is measured. Remarkably, results indicate that children, chimpanzees and capuchins are all able to faithfully replicate the actions they observe others performing, with the behaviour spreading without deviation along a chain of up to 10 individuals (Dindo et al., 2008; Horner et al., 2006). Taking a comparative view of deferred imitation may provide insights into the evolutionary heritage of our cognitive processes and the abilities of our ape ‘cousins’. However, comparative psychologists and anthropologists are not the only people interested in the study of deferred imitation. Developmental psychologists have also investigated deferred imitation as a tool to study the developmental trajectory of declarative memory in pre-verbal infants and also to gain further understanding of infantile amnesia (see for example Adlam et al., 2005; Barnat et al., 1996; McDonough et al., 1995). Also, those interested in robotics and artificial intelligence have also applied our current knowledge of deferred imitation to create models of human imitative abilities (Dautenhahn & Nehaniv 2002). In his 1962 book Play, Dreams and Imitation in Childhood Jean Piaget proposed that deferred imitation developed in infants when they reached 16 to 24 months. Piaget theorised that the maturing of mental representation allowed infants to encode an internal representation of an object or act, which could then be retrieved at a later date. It was this ability that allowed deferred imitation. Once infants develop the ability to imitate after a delay, they are no longer imitating an external model, but an internal representation. More recently, however, deferred imitation has been identified in infants as young as six months (Barr et al., 1996; Meltzoff 1988b); almost a year earlier than first identified by Piaget. As the age of an infant increases, so too does the length of time they are able to retain, and reproduce, specific actions. 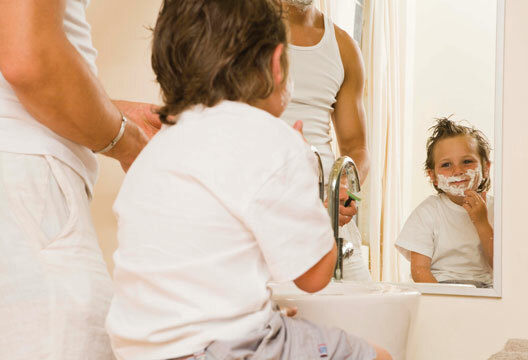 Eighteen-month-old infants only display imitation after delays of up to two weeks, but by 24 months they able to imitate after delays of up to two to three months (Herbert & Hayne, 2000b). These findings are supported by the earlier work of Kuczynski and colleagues (1987) who conducted a longitudinal study with infants in their own homes. The mothers’ reports indicated that infants over two years old were much more likely to show the capability to imitate after a delay than younger infants (around 16 months old). The capacity of infants to imitate after a delay appears to be very robust. Quite remarkably, infants appear able to exhibit deferred imitation even after changes have been made to both the testing environment and stimulus material (Barnat et al., 1996; Hanna & Meltzoff, 1993; Hayne et al., 2000; Herbert & Hayne, 2000a). In addition, in one experiment, 14-month-olds were able to imitate an act that had been presented to them on a television screen (Meltzoff, 1988a). This reveals that, despite being little over a year old, the infants were able to translate the television image to a real-world setting, even after a delay of 24 hours had passed since viewing the footage. In The Ape in Our House Hayes (1951) described how Vicki, the chimpanzee she home-reared, would spontaneously perform actions with familiar household objects that she had apparently observed her carers using. Hayes reported that Vicki would attempt to apply lipstick and brush her teeth with a toothbrush. Observational reports of orang-utans have also been published providing comparable evidence that they are capable of deferred imitation. Russon and Galdikas (1993, 1995) noted that free-ranging rehabilitant orang-utans performed a number of behaviours, such as hanging up a hammock, painting with a paintbrush, and even attempting to light fires. They concluded that the orang-utans must have observed human caregivers perform these actions at an earlier point in time and then later copied them. Caution should be observed, however, when interpreting these reports. Both these illustrations of deferred imitation by apes rely on observational data alone, much of it anecdotal. At the very least a detailed description of prior experiences of these animals is needed. Without true controls over what the apes had seen, how many demonstrations they had been exposed to, and whether it would have been possible for them to have learnt these novel behaviours through trial-and-error learning, these findings are somewhat inconclusive. Controlled, experimental testing is required. To date, only a few studies have experimentally inquired about the ability of apes to show deferred imitation, and the majority of these have focused on enculturated animals (see box opposite). Although these may not represent ‘typical’ examples of their species, their rearing history does beg for comparison with the developmental literature. The first study conducted with non-human primates revealed that enculturated chimpanzees out-performed mother-reared chimpanzees in their ability to imitate after a delay (Tomasello et al., 1993b). This finding prompted Bjorklund and colleagues (2002) to further test the abilities of enculturated chimpanzees. They concluded that all three of the enculturated juvenile chimpanzees they tested were able to imitate after a delay of 10 minutes. However, that all three chimpanzees performed ‘approximate target’ or ‘target’ behaviours during a pre-test baseline somewhat undermines this conclusion. The chimpanzees’ responses could have arisen from behaviours learnt individually, without the need for imitation. Furthermore, the delay imposed between demonstration and response period was only 10 minutes, much shorter than that in the comparable studies with human infants. As with studies with human infants (e.g. Barnat et al., 1996), the ability of apes to generalise across different stimuli in a deferred imitation paradigm has also been assessed (Bjorklund et al., 2002; Yunger & Bjorklund, 2004). Two of the three enculturated chimpanzees were able to generalise the required actions from one test stimulus to the next, even after an imposed delay of 10 minutes. Not surprisingly, the chimpanzees’ performances were better when the test stimuli remained constant. Yunger and Bjorklund reported comparable, if slightly weaker, results for enculturated orang-utans. Furthermore, like human infants, for whom it has been found that the strength of deferred imitation increases with age, the two older chimpanzees (seven and nine years old) tested by Bjorklund and colleagues showed a better ability to generalise than the younger chimpanzee (five years old). a wide range of test scenarios and delay lengths (up to six months) whereas the non-human primate research has only required the apes to imitate after very short delays (10 minutes) and often lack the stringent controls needed to draw definite conclusions about their abilities. More rigorous testing is required for non-human primates and other animal species. It appears that human infants show an improving ability for deferred imitation with age and, remarkably, by 24 months infants are able to imitate action sequences after a delay of up to three months. Furthermore, they are able to generalise knowledge they have gained from one test environment to another and from one test object to another. Evidence for deferred imitation has also been claimed for both (enculturated) chimpanzees and orang-utans. Like children, chimpanzees are able to generalise the knowledge they have gained from one test object to another. However, little work has been conducted to determine these abilities in mother-reared apes, and so the story does not end here. The implications of these findings are not just academic; they are also important for our daily lives, the education strategies that we devise for our children and the husbandry of captive animals. This knowledge provides us with a greater understanding of our own cognitive abilities and our close connection with our closest living relatives. We are undoubtedly a social species, and our ability to learn from one another has allowed for many of our great technological and cultural advances. We truly are Homo imitans, but our cultural abilities clearly have ancient evolutionary roots shared with our ape ‘cousins’. Enculturation describes the process whereby animals, particularly apes, are reared by human caregivers in an intensive environment resembling the upbringing of a human infant. The classic example is that of Vicki, the chimpanzee, raised by Keith and Catherine Hayes in their home during the 1950s (Hayes, 1951). Tomasello et al. (1993a) stated that, in order to be able to imitate, an individual must be able to understand the intentions of the demonstrator being observed. In order for chimpanzees to be capable of this perspective-taking, they must be raised in a human-oriented environment. Specifically, Tomasello et al. proposed that ‘chimpanzees enculturated by human beings seem to show more sophisticated skills of perspective-taking... enculturated chimpanzees have been subjected to what Vygotsky calls the ‘socialization of attention’: They have been raised in an environment in which joint attention to objects is a regular and important part of their social lives with their human caregivers’ (p.506–7). Such imitative ability, however, refers to chimpanzees matching the behaviours of human demonstrators, not other chimpanzees. So other researchers, myself included, take issue with Tomasello’s view (see Whiten, 1993). Specifically, Zentall (2001) noted that, as imitation has been shown in ‘species as varied as rats, pigeons, and Japanese quail… the responsible mechanism is not likely to be theory of mind or perspective taking’ (p.85). Adlam, A-L., Vargha-Khadem, F., Mishkin, M. & de Haan, M. (2005). Deferred imitation of action sequences in developmental amnesia. Journal of Cognitive Neuroscience, 17, 240–248. Barnat, S.B., Klein, P.J. & Meltzoff, A.N. (1996). Deferred imitation across changes in context and object: Memory and generalization in 14-month-old infants. Infant Behaviour and Development 19, 241–251. Barr, R., Dowden, A. & Hayne, H. (1996). Developmental changes in deferred imitation by 6- to 24-month-old infants. Infant Behavior and Development, 19, 159–170. Bjorklund, D.F., Yunger, J.L., Bering, J.M. & Ragan, P. (2002). The generalisation of deferred imitation in enculturated chimpanzees. Animal Cognition, 5, 49–58. Courage, M.L. & Howe, M.L. (2002). From infant to child: The dynamics of cognitive change in the second year of life. Psychological Bulletin, 128, 250–277. Dautenhahn, K. & Nehaniv, C.L. (2002). Imitation in animals and artifacts. Cambridge, MA: MIT Press. Dindo, M., Thierry, B. & Whiten, A. (2008). Social diffusion of novel foraging methods in brown capuchin monkeys (Cebus apella). Proceedings of the Royal Society B: Biological Sciences, 275, 187–193. Gergely, G. & Csibra, G. (2006). Sylvia's recipe: The role of imitation and pedagogy in the transmission of cultural knowledge. In N.J. Enfield & S.C. Levenson (Eds.) The roots of human sociality: Culture, cognition, and human interaction (pp.229–255). Oxford: Berg Publishers. Hanna, E. & Meltzoff, A.N. (1993). Peer imitation by toddlers in laboratory, home, and day-care contexts: Implications for social learning and memory. Developmental Psychology, 29, 701–710. Hayes, C. (1951). The ape in our house. New York: Harper & Row. Hayne, H., Boniface, J. & Barr, R. (2000). The development of declarative memory in human infants. Behavioural Neuroscience, 114, 77–83. Herbert, J. & Hayne, H. (2000a). Memory retrieval by 18–30-month-olds: age-related changes in representational flexibility. Developmental Psychology, 36, 473–484. Herbert, J. & Hayne, H. (2000b). The ontogeny of long-term retention during the second year of life. Developmental Science, 3, 50–56. Hopper, L.M., Lambeth, S.P., Schapiro, S.J. & Whiten, A. (2008). Observational learning in chimpanzees and children studied through ‘ghost’ conditions. Proceedings of the Royal Society B, 275, 835–840. Horner, V., Whiten, A., Flynn, E. & de Waal, F.B.M. (2006). Faithful replication of foraging techniques along cultural transmission chains by chimpanzees and children. Proceedings of the National Academy of Science, 103, 13878–13883. Kendal, R. (2008). Animal 'culture wars'. The Psychologist, 21, 312–315. Kuczynski, L., Zahn-Waxler, C. & Radke-Yarrow, M. (1987). Development and content of imitation in the second and third years of life: a socialization perspective. Developmental Psychology, 23, 276–282. McDonough, L., Mandler, J.M., McKee, R.D. & Squire, L.R. (1995). The deferred imitation task as a nonverbal measure of declarative memory. Proceedings of the National Academy of Science, 92, 7580–7584. Meltzoff, A.N. (1988a). Imitation of televised models by infants. Child Development, 59, 1221–1229. Meltzoff, A.N. (1988b). Infant imitation and memory: Nine-month olds in immediate and deferred tests. Child Development, 59, 217–225. Meltzoff, A.N. (1988c). The Human infant as Homo imitans. In T.R. Zentall & B.G.J. Galef (Eds.) Social learning (pp.319-341). Hillsdale NJ: Lawrence Erlbaum Associates. Piaget, J. (1962). Play, dreams and imitation in childhood. New York: W.W. Norton & Co.
Russon, A.E. & Galdikas, B.M.F. (1993). Imitation in free-ranging rehabilitant orangutans (Pongo pygmaeus). Journal of Comparative Psychology, 107, 147–161. Russon, A.E. & Galdikas, B.M.F. (1995). Constraints on great apes' imitation: Model and action selectivity in rehabilitant orangutan (Pongo pygmaeus) imitation. Journal of Comparative Psychology, 10, 5–17. Tomasello, M., Kruger, A.C. & Ratner, H.H. (1993a). Cultural learning. Behavioral and Brain Sciences, 16, 495–552. Tomasello, M., Savage-Rumbaugh, S. & Kruger, A.C. (1993b). Imitative learning of actions on objects by children, chimpanzees, and enculturated chimpanzees. Child Development, 64, 1688–1705. Whiten, A. (1993). Human enculturation, chimpanzee enculturation and the nature of imitation. Behavioral and Brain Sciences, 16, 538–539. Yunger, J.L. & Bjorklund, D.F. (2004). An assessment of generalization of imitation in two enculturated orangutans. Journal of Comparative Psychology, 118, 242–246. Zentall, T.R. (2001). Imitation in animals: Evidence, function, and mechanisms. Cybernetics and Systems, 32, 53–96.